Need a reliable vehicle locksmith in the West Midlands to cut and replace lost or faulty Citroen car keys? Car Key Assist are the best choice you can make - providing car key cutting, reprogramming and replacement for a range of Citroen makes and models. Lost Your Citroen Car Key and Need A Replacement or Spare? 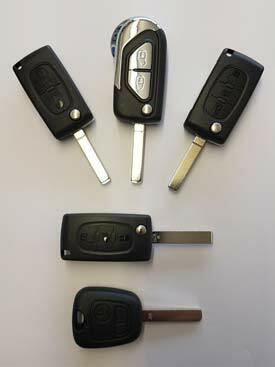 We can offer Citroen locksmith services for key remotes for models including Berlingo, C Zero, C1, C2, C3, C.Crosser, C3 Picasso, C3 Pluriel, C4, C4 Cactus, C4 Grand Picasso, C5, C6, C8, DS3, DS5, Dispatch, Nemo, Relay and Xsara Picasso. Our emergency locksmith services are available 24 hours a day, 7 days a week and our experts can be there to provide reliable, affordable assistance on the roadside, your home address or your workplace. We can guarantee the most reliable, efficient and cost effective services ranging from opening locked Citroens, making Citroen keys to existing locks and changing Citroen lock combinations. If you have had your car keys stolen and need help urgently, any lost or stolen Citroen keys can be deleted from the vehicle, so they will never work again. Providing automotive locksmith services across the Midlands, Shropshire, Staffordshire, Herefordshire, Worcestershire and Warwickshire, we are committed to offering every single one of our customers the best service possible.